The new place has a pet door. The old place didn’t. I have two dogs and I had three cats. One of the cats decided to leave here after one week. I am still sad about that but there’s nothing I can do about it. At the old place we had no fence around our yard, so the dogs had to go out on a leash. Sadie the cocker spaniel is a very leashable-walkable kind of dog. Eleanor the some kind of bird dog/chihuahua is not. She’s very zig zagable and jumpable though! You can totally imagine the time they had when they first arrived here. They almost didn’t know what to do. But once they figured out they could go in and out at their leisure we had it made. After a few days here one of the animals brought me a dead rabbit. A dead rabbit into the kitchen. It didn’t have a head. Nice. I’ve been graced with 2 drowned mice during the rains we had and a whole bunch of baby birds. One night about 4 a.m., my cats had a full grown robin in the laundry room. No more. I was done. The animals were to be locked out here in the back office/porch with their dog door and their kill. That lasted about 4 whole hours. The dogs whined and barked the entire time! 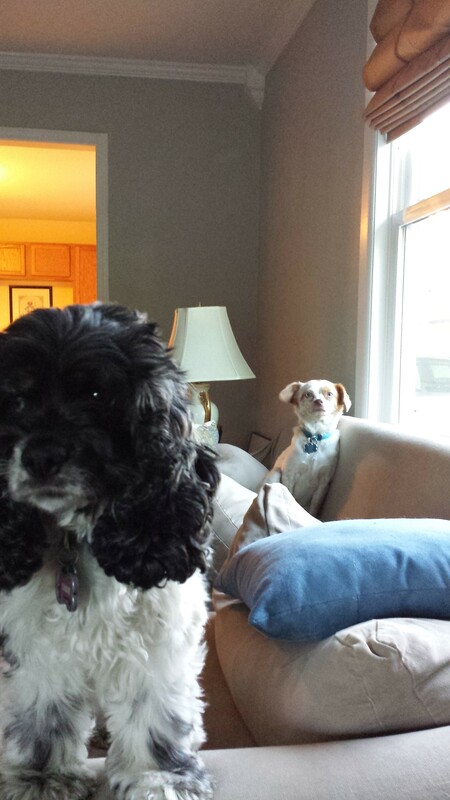 It’s been over a week now and they have not brought any animals in the house. I’m guessing because there’s nothing else out there to kill. Early yesterday morning, my parents took off with their camper back to FL. They left around 6 a.m. 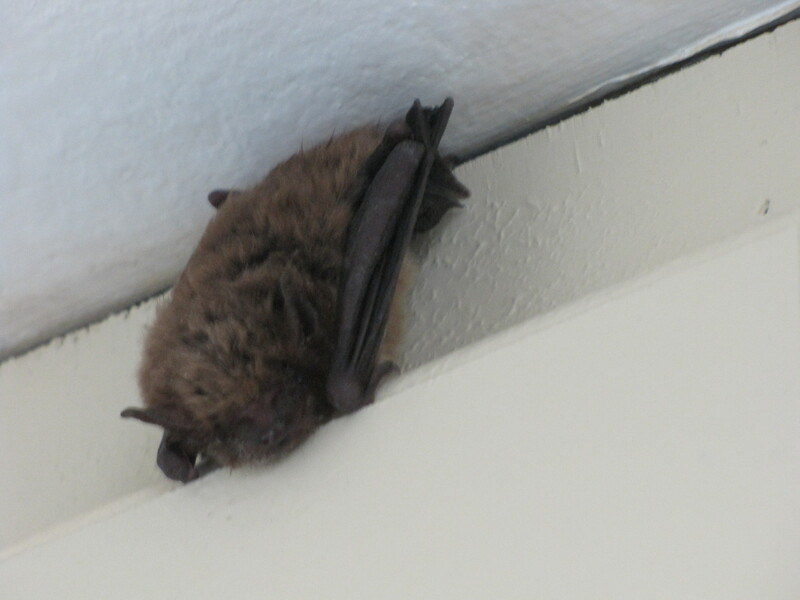 I went into the laundry room and noticed a BAT high above my cabinets close to the ceiling. Great. What do I do now? I had to go to work. I got the litter box and all the animal food out of there and shut the door. I figured the bat would still be there when I got home. And it was. I have two huge windows in my laundry space, so I took the screen off of one window, raised the blinds and opened it from the top. I got a great seat on the deck with a glass of wine at dusk and waited for the exit. It was cool to watch her spread her wings. I guess she was getting warmed up for the flight. She made a few practice flights, but never hit the opening. Great. What do I do now? It was too dark for me to view her anymore, so I gave it up and went inside. I considered sleeping with that window open but you know, I’m on the north side. It would’ve totally been fine and I think I would’ve done it if I had to! But around 12:30 a.m. (bat hour) I peeked in the utility area. I cracked the door, I flicked on the light. No bat, that I could see anyways. Still afraid she might be there, I shut the window and locked it. Then I shut the utility room door as well. I slept and checked the space again in the morning. No bat. But I have lots of clutter in there due to the move and the garage sale that I just had. I shut the space up just to keep the animals out of the bat space in case she was still around. After work today I felt positive that the bat was gone. I am doing laundry as I write this and lots of it. That little critter but a damper on my clothes cleaning party last night for sure. How she got in I’ll never know. I’m having someone check the attic for bats just to be sure there’s not an entire colony up there. I feel blessed by the bat. They’re cool animals and often arrive in times of transition. I feel that’s just why this one came to visit. Have a safe flight my friend. Categories: nature | Tags: animals, bat, bats, door, flight, mo, pet, springfield | Permalink.